Preparing any holiday meal is certainly a big task, but it doesn’t have to be a one-person job. Get your kids involved! Many parents fear children in the kitchen with hot stoves and sharp knives but following a few simple steps to keep things safe will allow kids to earn the many benefits of preparing a meal. Let children be a part of the process from the very beginning. When shopping for ingredients explain what dish each ingredient will be apart of and have them help in picking out produce. Seeing the variety of colors and textures in the store will make them interested in trying new foods and ready to help prepare your holiday meal. When it comes time to start cooking, establish some kitchen rules; only use a knife if someone is helping you, if you spill something clean it up, don’t touch the hot stove. Remind children to wash their hands and if they have long hair, put it up. Having children read a recipe will help with their comprehension and communication skills. Cooking is a science, reading a recipe teaches the importance of following directions and staying on task. When it comes time to measure things, doubling a recipe is an easy way to teach some basic math skills. My favorite part of measuring ingredients as a kid meant getting to stir everything together afterwards! Kids of any age can help with washing vegetables and sorting ingredients. This is also a great time to get kids excited about healthy choices. Remind kids there are endless types of vegetables, eating them will make you strong and help your brain develop. If you have older children, demonstrate how to properly use a knife so they can chop vegetables. 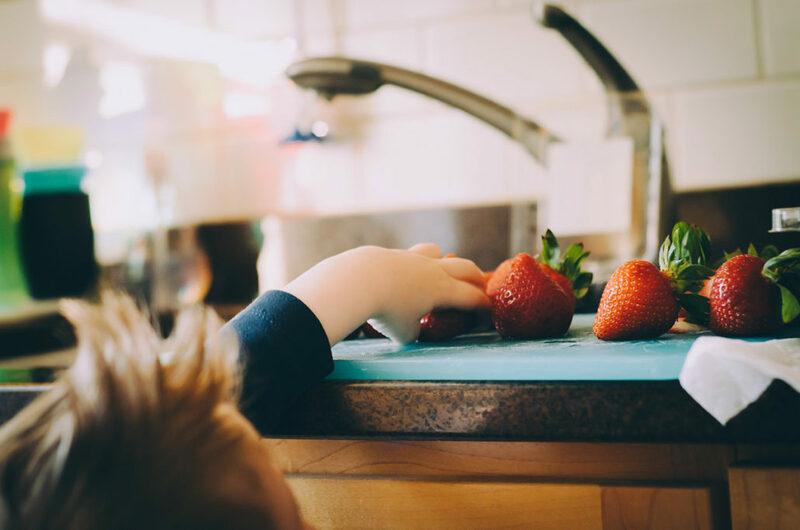 When it gets closer to meal time, tasks like counting the number of forks needed and transferring food into serving dishes is also kid friendly. If you’ve never cooked with your kids before it can certainly be daunting. But start with small tasks and be patient. Some of my fondest memories are cooking with my mom and I’m sure she would say the same. It allowed us to bond on even the busiest weeknights. Cooking is a vital life skill and the earlier kids start learning the better. Remember to thank children for their help and enjoy the meal they helped create.